17 July 2009, Shenzhen – All people have the ability to protect the environment by taking small steps towards sustainability. 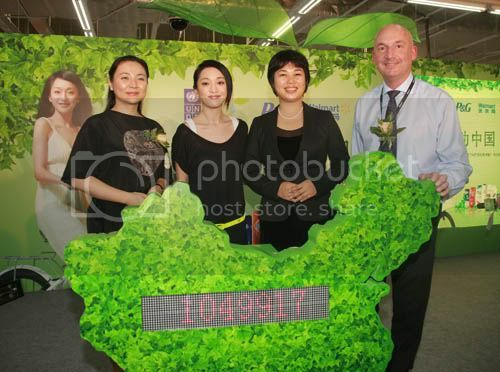 This was the message conveyed at the launch ceremony for “Green China Action,” a new campaign scheme that brings together P&G and “Our Part”, a joint environmental awareness initiative between United Nations Development Programme (UNDP) and the Chinese actress/celebrity Zhou Xun. From July to November, they hope to join forces to promote green consumption and foster behavior change toward a low-carbon lifestyle. The campaign was launched today at Wal-Mart Shekou Store in Shenzhen. Zhou Xun, UNDP’s National Goodwill Ambassador, announced her “Green Commitment,” calling for consumers to start from little daily choices around them and play their part in improving our environment.